WhatsApp is being the best instant messaging app we can find around us for Android as well as for iPhone and other devices. We can extract most out of WhatsApp from its features by unveiling hidden WhatsApp tips and tricks. It makes you technologically sound to know the best tips and tricks of WhatsApp and implement your own hacks on WhatsApp messenger. Download latest Whatsapp for more security features so that you can protect your information from hackers. Moreover, you can get some more best features with new versions. Now we will look at the best ways, Tricks and Tips to use your WhatsApp on PC, android smartphone or iPhone more effectively. To use your WhatsApp on your Android smartphones, you need to run it at first, so don’t you ever wish to have a lock or a security kind of thing to open your WhatsApp android app like you have password for Android phones, Windows phones and other phones, I think you do, so the first tip that I am going to give is to have a WhatsApp lock. Many a times we want to keep our chats or messages secret and protect our data from hackers. We don’t want others to read our messenger messages and chat logs, and it will be a bit embarrassing if it is so. As this WhatsApp app doesn’t need login credentials anyone can open your WhatsApp account on PC or android smartphone. A best way to get rid of the problem is to use a security lock to your WhatsApp messenger. My suggestion for you is to download and install latest WhatsApp lock other than something else. It is a more secure way of locking your WhatsApp messenger from hackers. 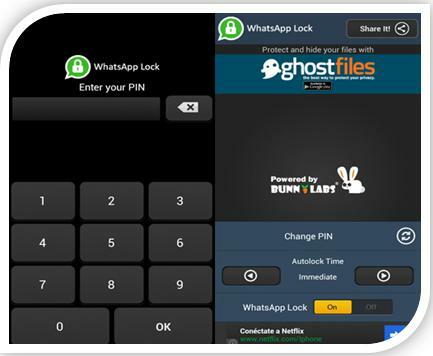 You can download WhatsApp lock from the below link to your PC /Android smartphone. Install WhatsApp lock and use it to protect your WhatsApp account and to keep it secure from hackers’ hands . Going to the next tip, you need to pay 0.99$ as a subscription fee after the first year of using WhatsApp messenger app. You may want to use WhatsApp messenger for free on windows 10/PC for few more years by without paying. So use the next hack to increase latest whatsapp. This is the best tips among whatsapp security tips. You can extend your trial period of WhatsApp on PC or android smartphone without paying a penny. You might have wondered at a glance about the hack. Actually we need to pay approximately 1$ for one year subscription to use WhatsApp after the trial period of one year. But to use it freely for few more years just follow this: After your trial period is over, just delete your WhatsApp messenger account and uninstall WhatsApp from your Android smart phone. Then go to Google play store and install the latest version of the App on your Android smartphone or Windows 10 PC.Then create your new WhatsApp account with the same mobile number. Now you can use WhatsApp for one more year for free. You can delete your account under settings -> Account -> Delete My Account, then enter your fancy mobile number in the field provided and click Delete My Account. 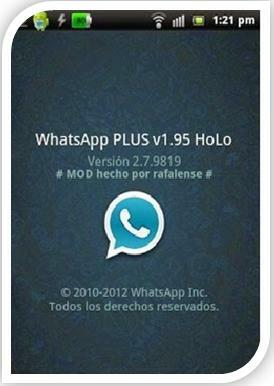 The present green and black combination of WhatsApp looks very attracting and pleasant but if you wish to experience a bit more subtle ambience, then you can download and install WhatsApp PLUS Holo[not from official whatsapp.com] to your android smartphone or windows 10 or windows 8.1/8 or windows 7. The blue color looks of WhatsApp plus will definitely give you a new experience of using WhatsApp,though unofficial messenger and of course you can change themes in WhatsApp Plus. The underlying features remain same; you can send messages, videos and whatever you want. The greatest advantage in using WhatsApp Plus is that it is free for lifetime. You can send media files such as music files, image files and video files to your friends through WhatsApp from your PC/Laptop or Android phone and many a times you don’t want to download these automatically. It may be any one of your reasons to get rid of downloading these media files, may be your network connection on your android phone is weak that it is just enough to send messages or your data balance may be low. 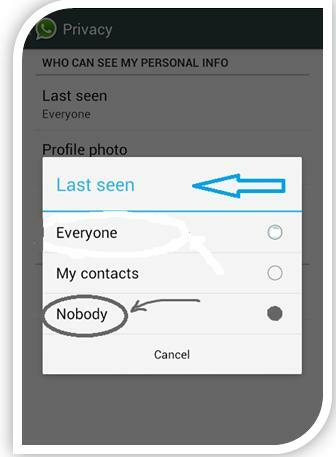 But do you know that now you can turn off this feature of whatsapp. Just follow me to turn off this. Do you know that I have made you know how to get rid of this problem. If you own an internet connection for your windows 10 or Windows 8/8.1 or Windows 7 PC; you can use WhatsApp Web Version using Google Chrome 36+ on your PC and it gives an experience of using WhatsApp on PC. Right now it is only available with Google Chrome 36(plus) + only, but you may get for other browsers also. If you want you can Download Google Chrome 36 plus for your Windows 10 PC from the below link. As I said above, you can use WhatsApp on your Windows 10 PC now, not a completely installed application but you can use it whenever you want. 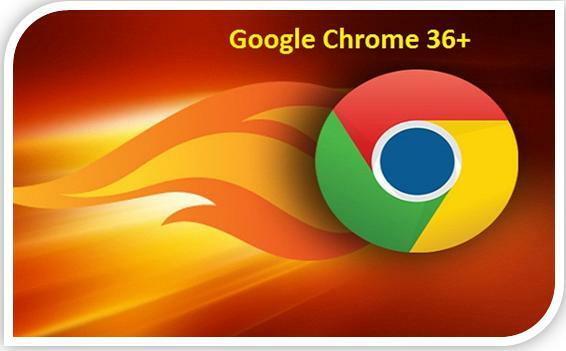 For that you just need to do one thing first, download Google chrome 36 plus from the above link provided. WhatsApp web version is only available with Google Chrome 36+. There is a short procedure to follow and you can find it on WhatsApp Web Version for Google Chrome 36+. There you can find out the exact procedure on how to use WhatsApp Web Version on Google Chrome 36+. You can also use WhatsApp on your Windows 10 PC as an installed application rather than using WhatsApp Web Version on Google chrome 36+, this is very much easier than the word easy. Proceed further to know the more tips and tricks. It is the right time to exactly know how to Download and install WhatsApp on windows PC. You will wonder after knowing that you can run any Android App on your Windows 10/8/8.1/7/XP along with WhatsApp. Don’t you believe me?check this if you want to know how to download WhatsApp for your PC/Windows 10/8/8.1/7/XP. You can now use WhatsApp on your Windows PC, for this you need to Download BlueStacks App Player for Windows 10or windows 8/8.1 or Windows7/XP as I was explained in the article Download WhatsApp for PC-Play Android Games on Windows 10/8/8.1/7. 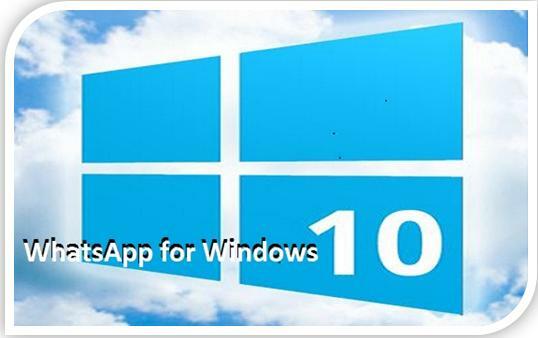 Make some time to know the exact procedure of using WhatsApp on your Windows 10 PC. You can of course download BlueStacks for your from the below link. As you already know that you can send any music file or video file or image file to your friends through WhatsApp messenger app. Do you ever wish to share any PDF file or ZIP file or APK file with your friends… Now you can do exactly the similar thing with this astonishing trick, you can share almost anything on your WhatsApp. 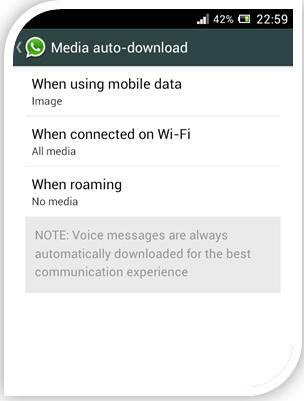 You need to Download Whats Packed 2 Ads apk and install it in your Android smart Lollipop Phone to use this feature of WhatsApp. After that you can send any PDF, Zip or Apk file to your friends. But before that make sure whether the other person who is receiving these files has also installed this WhatsApp Whats Packed 2 Ads on his android device. You can download this Whats Packed 2 Ads from the below link. You may sometimes wish to delete conversations on your WhatsApp and many a times you will delete some conversations intentionally or accidentally. If you want to recover those deleted conversations this simple tip/trick will definitely help you. Uninstall WhatsApp on your Android Phone and reinstall it again. During the reinstallation, it will ask you to restore messages. Click Restore to restore all your deleted Conversations of Whatsapp. It will be so easy and convenient if we have some of our important contacts created as shortcuts, so that we don’t need to search for them again in our contact list. Luckily in Android Phones, without installing any third party application we can do this very easily. If you want to create shortcut for any of your contact or group, just long press on that particular contact or group, then a menu will appear as a pop up with some options, among them choose Add conversation Shortcut. In Apple iPhones 5/6/6+ you need to install a third party app 1TapWA to create a shortcut for your contacts. Along with this feature you can also edit photos using 1TapWA and it also has action scheduler. Using this simple tips create shortcut for your contacts. 11. WhatsApp Surprising Tip: Hide your original Image with another Image while sending. If you don’t want to share your Profile picture with your friends then you can hide it, this feature is available with the latest version of WhatsApp now. If you want to hide your Profile Picture then go to Settings and click Account Privacy option and select Profile Photo and choose Nobody option if you really want to hide your profile picture from other Whatsapp users and also from hackers. Follow this this simple tip to hide your profile picture. If you want to change your WhatsApp account’s phone number then you can do it simply now with the latest version of WhatsApp. Just go to Settings -> Account -> Change Phone number, It will ask you to enter your old phone number and new phone number. Enter both of them and press done.This Whatsapp tip might come handy. You need to verify your new phone number again after changing the number. Your contacts, groups and messenger messages will be migrated to the new account automatically. You may be sending and receiving a lot of images from your friends. Many a times you don’t want to see them all in your Gallery where you kept your photos. You could have wished to hide them in one of the folders and made them not to appear in the gallery. Now here is the trick to do so. Just Go to File Manager -> Phone memory -> WhatsApp folder -> WhatsApp images folder , you can see all of the WhatsApp photos in that folder. Now create a new file with name .nomedia. To create a new file, click new button on the lower left corner of your screen and you will see options to create a new file. If you are in a plan to buy a new phone then you may want to shift all of your databases, conversations and all of your WhatsApp data to your new Phones. So here is the trick to do that. 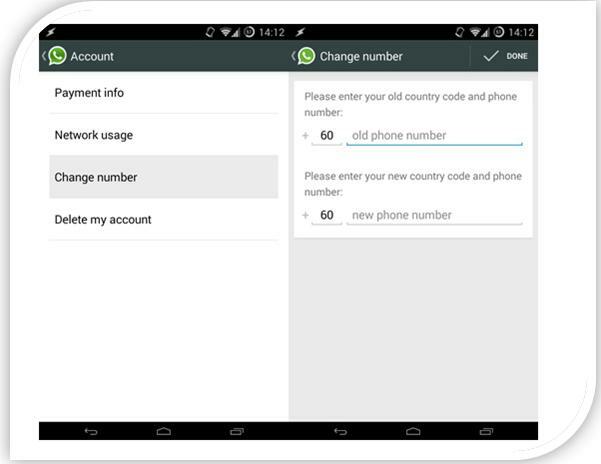 Any how you need to install WhatsApp again on your new smart phone and need to verify your phone number again. So before installing WhatsApp messenger on your new Phone, try to copy the WhatsApp messenger folder from the File Manager to your PC/Laptop and Copy it to your new phone in the same place. Both the phone should be of same OS to do that. Then install your new WhatsApp on your new smart phone. Then you will get all your conversations or messages and chats to your new phone. You can get chat heads for your WhatsApp messenger also, as Facebook messenger has this chat heads feature in built, for WhatsApp you need to install WhatsApp Chat Heads apk to get this feature. You can download it from the below link provided. Best Laptops/PCs for Christmas and New Year, Who is the Winner of Windows 10 Spartan Vs Chrome War? 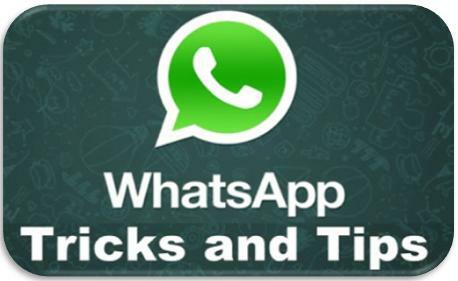 That’s all about the tips and tricks of WhatsApp, you can try out these tips and tricks in your WhatsApp for better experience. If you found these tips and tricks useful please share it with your friends through social media to protect your PC/android devices from hackers. Please let me know How can I use the same number whatsapp on pc and android phone in same time different place. Please let me know if there have require any payment please do let me know ! It is very urgent for me . Looking forward for your reply …………..
Hello Mondal, thanks for contacting us. By using a single mobile number you can create only one WhatsApp account. If you try to create another WhatsApp account using the same number, the account in the previous device will automatically get deleted. But you can use WhatsApp web option. Try it if it suits your need. Can I use one mobile sim for Android phone as well as laptop Window 7 for what’s app at same time? Can I use one mobile sim for what’s app at the same time using Android phone as well as laptop window 7 together? Hello Raj, With one mobile number you can create only one WhatsApp account. If you try to create Another WhatsApp account on another device then the account in the other device will automatically gets deactivated. I just want to know, is it possible to restore the chat history when shifting from PC to android phone? hello Sans, You can do it I think. For that, go to settings->chat settings->backup conversations. 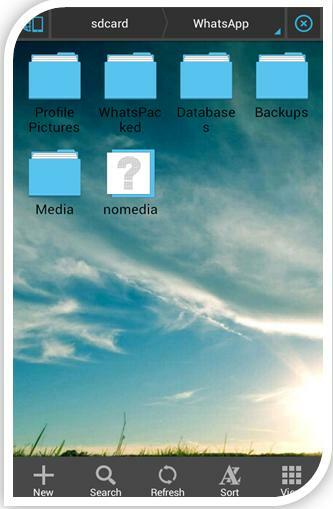 Then go to your phone storage via file manager, choose the folder named Whatsapp, go to the databases folder. Choose the one without any date in its file name. It is the latest one. Transfer that file to the same location in your new device after installing Whatsapp. 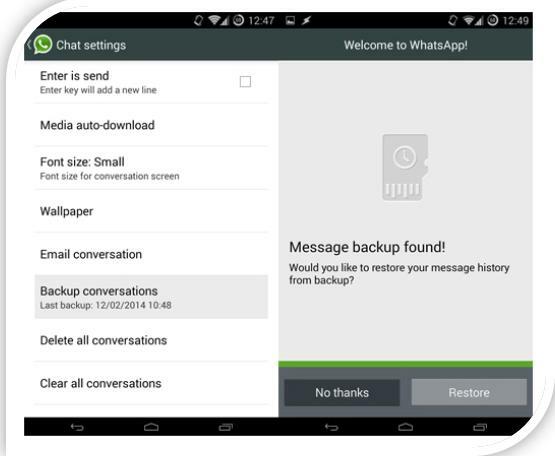 Now when you open Whatsapp for the first time in your new device, it will prompt you to restore the chats. Hi i’m using dashsdow plus for whatsapp i want to get message like facebook messanger without opening whatsapp and reply.Plesae help me. Hello Kishor, Sorry to say that you can not use two WhatsApp accounts on a single Mobile. With Single Device only one WhatsApp Account will work. I want to uninstall whatsaap from android phone but want to keep its file so that whenever i want to reinstall i dont need to go to play store and download it again. Any solution ? i am using what app on my phone and pc also via web whats app, but when i delete messages same time it get deleted from my lap top also. actually i want to keep this messages oh mu laptop but not on my cell phone due to low memory. i would appreciate if any one can help me for this issue. Hi dinesh, All the contacts and chat data on your WhatsApp Web will be in sync with the WhatsApp on your mobile. So, if you change anything on your WhatsApp on your mobile, it will get reflected on your Laptop also. unless you email yourself chat history from your phone or export chat.. send it via email with or without media and you hvc record of your files… open it as txt file using notepad or some text program.. then you can delete it but stil be able to see your chats in txt from.. remember to add date on your file name when saving it for future navigation . How can some one knows ,that we are clicking for chat ..my experience that i start Whatsapp & click on particular contacts & he is offline seconds ago . that’s not co incident i repeatedly check . what tricks he apply ,with help of trick he can know that i click & start my whatsapp.or press on number. I repeatedly check that happened every time. Hw can I use two whatsapp numbers in one app? Please help me………. Hw can I use two whatsapp numbers in one app.?? Please help me……. Can someone tell me how I can transfer all my whats app pictures/images and videos to my PC? Hello Shai, you can transfer all the data to your PC. Just go to file manager and you can see WhatsApp folder and in that folder you can see all the images, videos. Just copy that folder to your PC. Thanks Sarvesh!! finally did it! How can you see amount of messages with your friend in android? Can I prevent whatsupp messages from being seen on whatsupp Web? Awesome Question Mate 🙂 😀 but i think it’s not possible to hide messages in whatsapp web. 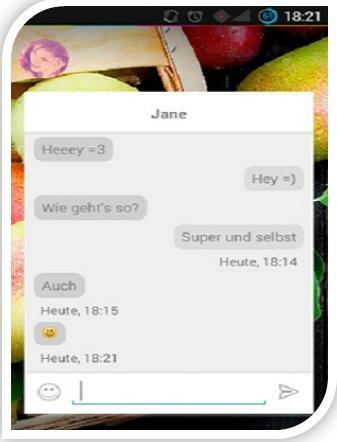 Is it possible to prevent the messages appearing on whatsupp Web while still getting them on whatsupp on the cell phone? Eran Leviteh, I think its not possible as of my knowledge. If it’s possible we will update here between thanks for asking such a intelligent question. Thanks. Hi ,i am using whatsapp web to see my gf whatsapp messages.I doubt she is cheating on me.I am able to read all messages of her but problem is that she deletes some messages during live conversation.Is it possible to read her live conversation messages without letting her know that as currently if i try to click on particular contact name,then the new message display as read .I want this messages to remain unreadable unless it read by her from phone.